My best friend sleeps on his stomach, which makes me, a side sleeper, think that he’s crazy. I mean, how great does it feel to curl up on your side under a blanket? So, today, my fellow side sleepers, I’ve prepared something quite useful for you: top 7 pillows perfect for this comfy sleeping position. Let’s dive right in! What’s the Point in Leg Pillows for Side Sleepers? cover: 100% cotton. 20 x 28 inches. cover: 70% polyester + 17% viscose + 13% nylon. Standard – 26 x 18 x 5 inches, King – 33 x 18 x 5 inches. cover: 60% polyester + 40% bamboo rayon Standard – 20 x 26 inches, Queen – 20 x 30 inches, King – 20 x 36 inches. Helix is great for pain relief. Its softness and support combined together provide excellent pressure relieving properties, helping your body stay relaxed throughout the whole night and ensuring there’ll be no pain in the morning. The pillow comes in two sizes (Standard and King). The cover is a blend of Tencel and polyester. There is a gusset layer under it. The pillow comes with 2 additional layers you are free to insert or remove to find the perfect loft. Each layer is a blend of cross-cut memory foam and down alternative. The product is protected by a 100-night sleep trial and a 3-year warranty. The coolest thing about this pillow is the overall comfort it provides. Thanks to the blended filling, you get the support of memory foam and the softness and coziness of down alternative in one pillow. To me, that’s the best of both worlds. The thing that disappointed me the most was that this pillow didn’t do much to help me sleep cool during the night. I’m not saying I was sweating heavily. It’s just that I expected it to be more breathable and cooling. If you tend to sleep hot, you should keep this in mind. Perhaps, the cooling model by Helix would work better. Having a luxurious touch to it, this model by Helix does have enough benefits to outweigh the weak sides. And its ability to help you get rid of neck and back pain is one of them. Another contestant for the right to be among top pillows for side sleepers is this adjustable model by Eight Sleep. The manufacturer calls it the “Ultimate” pillow, and even though one pillow cannot suit everyone’s preferences, this one does its best and works quite well. Although a perfect side sleeper pillow is said to be more than 5 inches thick and around 7 out of 10 on the firmness scale, tastes differ. That’s why getting a pillow that can be adjusted is a reasonable idea. And this model is the #1 candidate for that. There are three removable layers inside this pillow, one of which is denser than the other two. You can adjust not only the thickness of the pillow by removing or adding layers but also its firmness by putting the densest layer on top, bottom, or in the middle. The filling is made of shredded foam and the cover is pure cotton. The coolest thing about this pillow is how versatile and adjustable it is. You can do whatever you want and shuffle the layers as you wish. That’s the thing about this pillow: the number of possible combinations is quite large, which means you will definitely find the most comfortable one for yourself. The worst thing I’ve noticed about this pillow is the slight odor from the foam. It is a common issue for products containing foam, so I wasn’t too concerned about the smell. It wasn’t too harsh or chemical and reminded me of a subtle plastic smell. I left the pillow to air out overnight before using it and the off-gassing disappeared completely. I must admit: I really enjoyed sleeping on this pillow. What I enjoyed even more is shuffling the layers and testing the comfort layers, which resulted in finding the perfect combination for my needs and preferences. I’m sure you will find yours too! This model by Plushbeds is comfortable, supportive, thick, and organic. Dunlop latex, which serves as a filling for this pillow, is known to be firmer than its alternative – Talalay latex. That’s the main reason this is a great latex pillow for side sleepers. Besides, the filling is shredded into small pieces, which makes it easier to fluff the pillow and adjust it according to how you place your head when sleeping on your side. It comes in three different sizes (Standard, Queen, and King), which provide more comfort choices. The filling is made from organic Dunlop latex, which is safe to use and GOLS certified. The cover is 100% organic cotton, which is breathable and pleasant to the touch. The coolest thing about this pillow is how safe it is to use. 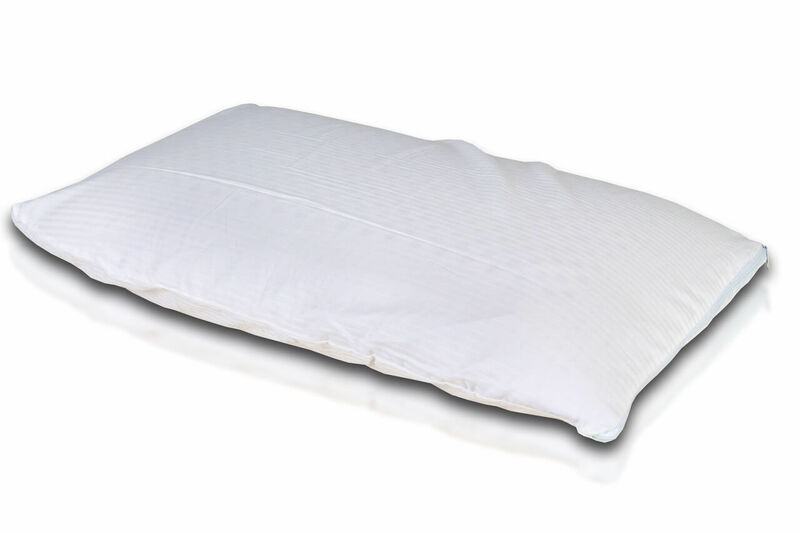 If you are concerned about your health and what you sleep on, you are going to appreciate the fact that this pillow is GOLS certified (Global Organic Latex Standard) and doesn’t contain any harsh chemicals or dyes. It is hypoallergenic and resistant to dust mites, which makes it safe even for children. The worst thing about this pillow is the fact that you can’t adjust its thickness, as there’s no zipper on the cover. I mean, I realize that, for side sleepers, the pillow is supposed to be thick. But tastes differ, and some people might enjoy the pillow more if it was a little bit thinner. 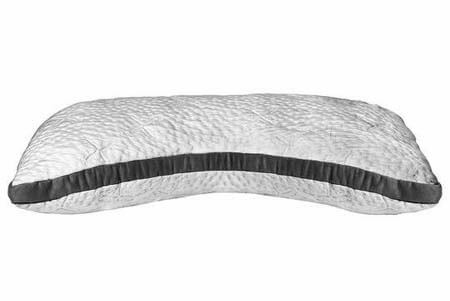 The bottom line is: this pillow helped me sleep like a baby without having to wake up and move the filling around or adjust it in any other way. I’m sure you will fall in love with it too the second your head touches the cover. I guess people at Leesa are really serious about high-quality sleep and everything that’s connected to it. 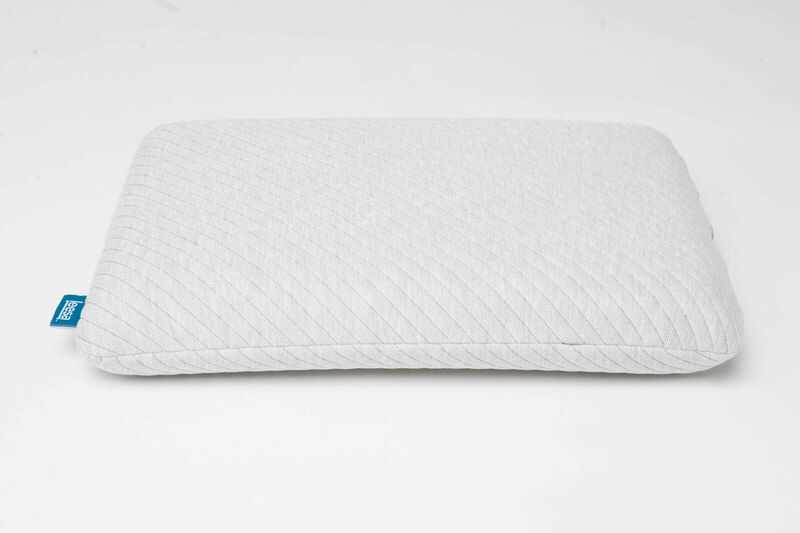 Its proprietary filling is what makes it stand out from other memory foam pillows on the market. Unlike them, it is well ventilated and, consequently, sleeps rather cool. Side sleepers who tend to get hot during the night or live in hot and humid climates will really appreciate this pillows construction. The filling is made of the Avena Foam, which has numerous ventilation channels for breathability. The cover is a combination of polyester, viscose, and nylon. It comes in two different sizes – Standard and King. The manufacturer offers a 100-night trial period. The absolute best thing about this pillow is how it is able to keep its shape. The foam is quite bouncy and responsive, and the pillow doesn’t go flat even after regular use. This means it will be able to provide consistent support for your neck and head without flattening. The worst thing I’ve noticed about this pillow is off-gassing. It wasn’t harsh or too strong, but I could clearly feel it. It is a common issue for a foam material, still, I know that some people are quite sensitive to smells and might find it too annoying. But don’t worry, it disappeared completely in a day. To tell you the truth, I can’t complain about this pillow. It is great for sleeping on the side, supportive, and soft. I’m sure you are going to love it just as much. Don’t hesitate and order now! Let me introduce you to another contender for the title “the best pillow for side sleepers”. This adjustable pillow by Coop Home Goods combines quite a few appealing features, including comfort levels and versatility. You can change the firmness and height, you can choose from different sizes, you can easily clean the cover by throwing it into the washing machine. And it’s all for under $60 only! Isn’t it the best value for money? The filling is the CertiPUR-US certified visco elastic shredded foam, which is supportive and safe to use. The cover is a blend of polyester and bamboo rayon, which is soft, breathable, and pleasant to the touch. The zipper on the cover allows sleepers to adjust the thickness of the pillow by simply removing some of the foam. It comes in three different sizes – Standard, Queen, and King. The coolest thing about this pillow is how supportive it is. It impressed me so much that I decided to test it out and put a couple of books on top of it. They sank in, obviously, but the foam still managed to support them. And, given the fact that a human head is lighter than a stack of books, it will also be properly supported when sleeping on the side. The worst thing I’ve noticed about this pillow is all those little lumps of shredded foam. When the pillow is fully filled, they aren’t that noticeable, but if you decide to make the pillow a bit thinner and take out some of the foam, you will feel the lumps. It’s not a big issue, but it might still annoy some sleepers. In general, I enjoyed sleeping on this pillow. It is firm enough for a side sleeper like me but provides some cushioning and contouring as well. And that, in my opinion, is a great combination. Order here and see for yourself! 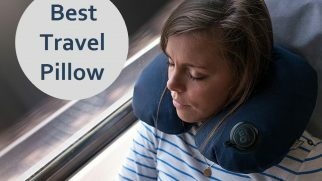 This Plushbeds product definitely deserves to be on this list and can fairly be called an excellent down pillow for side sleepers. It’s breathable, hypoallergenic, lightweight, and moldable. Thanks to a blend of down and feather, this pillow is both supportive and soft. Besides, it won’t go flat over time and will last considerably longer than feather and memory foam pillows, of course, if you take care of it properly. It comes in three different sizes (Standard, Queen, and King). The filling consists of a down and feather mix. The 250-thread-count cotton cover protects from feather quills and ensures breathability. The manufacturer offers a 3-year warranty. There is no option of sleep trial for this product. The thing I liked the most about this pillow was its softness. Down is naturally a soft material that contours around your head very well. It’s not as resilient as memory foam but is very cradling, helping your body relax and keeping your body aligned. The worst thing about this pillow is, again, its softness. To me, it was fine because the feeling of sinking in helps me relax and fall asleep faster. But I feel some side sleepers would not be comfortable with such level of softness. And unfortunately, there are no alternative firmness options available with this model. 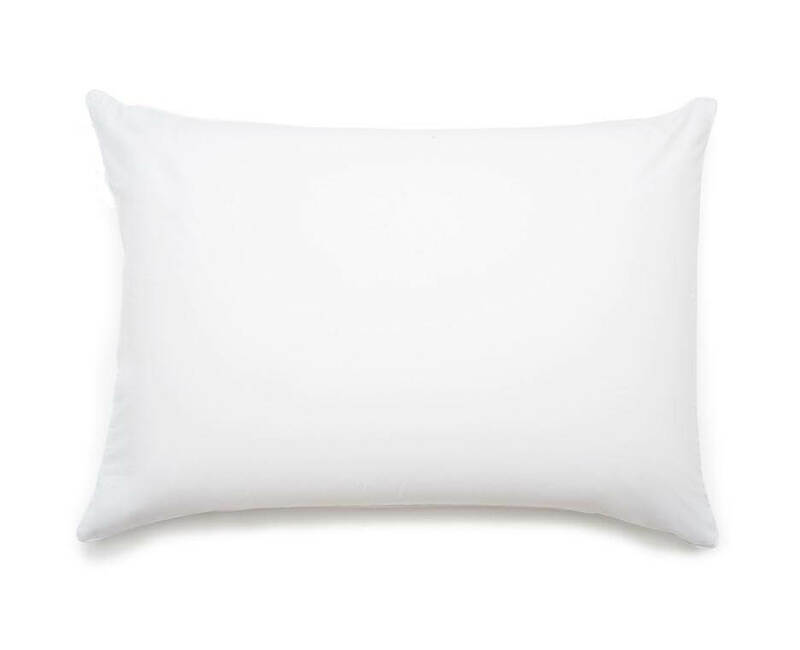 With this down pillow, I felt like I slept on a cloud. Other side sleepers, though, might not like such a soft feeling. But you’ll never know if you don’t try. Want to get a personal cloud to sleep on? Order your Plushbeds pillow here! Judging by its name, this should be the most suitable pillow for side sleepers. Judging by my experience, it is, indeed! Its non-standard, curved shape makes it very comfortable and supportive for people who prefer sleeping on their side. The pillow comes overstuffed, which is about 8 inches thick, so you can feel free to remove lots of shreds until you find the perfect thickness. Or not remove anything at all. Just mold it to give it the desired shape, and you’re good to go! In my opinion, the main benefit of shredded foam pillows is that they’re much more breathable than one-piece foam ones. Only one size option is possible. Inside the pillow, there are shreds of memory foam, which can be added or removed to form the desired thickness. The cover is made from Tencel, which is moisture-wicking, soft, and breathable. The pillow features a curved shape with higher and wider sides and lower and narrower center. Nest Bedding provides a 100-night sleep trial and a 2-year warranty. 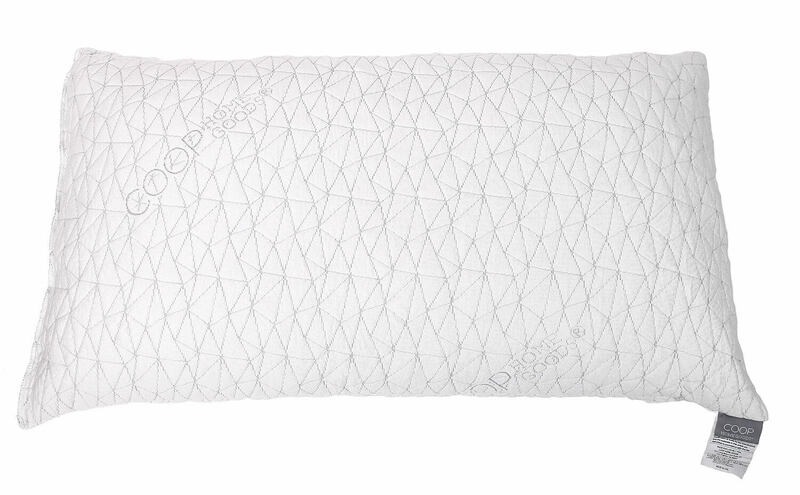 The absolute best thing about this pillow is its shape designed with side sleepers in mind. The sides are higher and the middle part is lower, which provides an easier transition from one side to another. And there is a curve in the center for more comfort when turning. The worst thing I’ve found about this model is that it’s not machine washable. Even though the cover has a zipper and can be taken off, you can’t put it in a washing machine for cleaning. You should clean it only with a damp cloth. To me, that adds certain inconvenience. Although there are some weak points about this pillow, I still find it a worthy investment. It’s a great model for side sleepers. And I loved sleeping on it, even though I frequently switch from side to back sleeping during the night. Feel like this model can become the most suitable pillow for you? Order here! Memory foam. This doesn’t even have to be explained, right? Dense memory foam is thick and supportive, which is perfect for side sleeping. And when it’s shredded, it only adds a bit more cushioning and a more plush feel. Latex. This material is squishy and responsive, highly supportive, and maintains its shape rather well. Buckwheat. It might seem to be weird at first, but this material is actually great for side sleepers. It is firm, easy to mold, and natural. The only downside is the grinding sound the buckwheat makes when you move the pillow. Down. 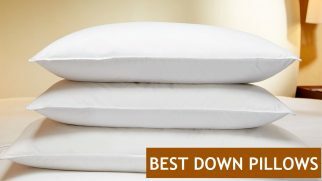 Pillows made from down are very durable (they can last up to ten years!). They are good for side sleepers because of their great moldability and adjustable loft. But some models might lack proper support. Feather. 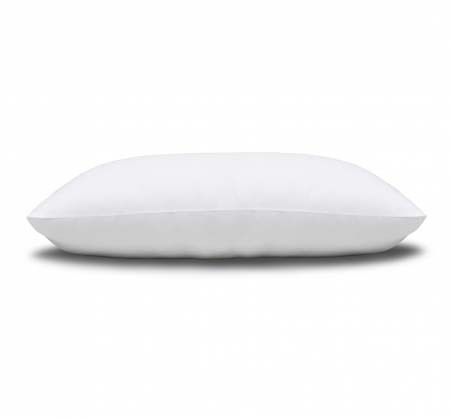 Similar to down pillows, these are long-lasting, moldable, and conforming but they might sleep hot and require constant fluffing to maintain proper support for a side sleeping position. You will get rid of your neck and shoulder pain. Sleeping on a suitable pillow will keep your neck and spine in a neutral position, which will reduce stiffness and allow the muscles to relax completely, thus eliminating any neck and shoulder pain. You won’t experience morning headaches anymore. When your neck is supported incorrectly (or not supported at all) during sleep, this can result in morning headaches or even migraines. However, sleeping on a proper pillow will prevent those things from happening. If you’re pregnant, you will create a healthier sleeping environment for yourself and your child. Sleeping on her side is the #1 recommended position for a pregnant woman. It’s hardly possible to sleep on the stomach when pregnant, and back sleeping is also not an option for it puts too much weight on the body. Side sleeping, on the other hand, puts the weight and pressure away from the body. It’s especially beneficial to sleep with a special body pillow for pregnant women. You will stop snoring. Back sleepers are usually the ones who snore, but side sleepers also experience this issue when sleeping on an unsuitable pillow. With the right pillow, your neck will be properly positioned, your spine will be aligned, and your head will stay straight, which will prevent you from snoring. Material. Look, I’m sure you already know this, but let me repeat: the pillow material for a side sleeper should be firm and supportive. Feather pillows just won’t do! Shaping possibilities. Some pillows have a shredded filling, others come in solid shapes. You should consider your sleeping preferences and decide, whether you want your pillow to keep its solid shape during the night or want something moldable and adjustable. Certification. If you’re anything like me, you also feel concerned about your health. That’s why making sure that your pillow is safe to use and certified is very important. Trial period. This comes in handy when you don’t know what you’re looking for (yet) and want to try out a couple of options. A trial period is just a guarantee for you, which will make you feel safer, especially if you’re considering investing in a more expensive pillow. But even if you don’t have any of them, you may still greatly benefit from having a pillow between your hips. The thing is a side sleeping position promotes knee friction during sleep. Some people feel discomfort from that to a very great extent, which results in restless nights with lots of tossing and turning. A knee pillow is an inexpensive solution, but it can really make a difference. it’s capable of not only removing hip discomfort but also relieving lower back pain. Another benefit is better spinal alignment. When sleeping on your side without proper alignment, you risk ruining your posture. This can result in chronic pains, stiffness, and even more serious health issues. By the way, it’s not necessary to buy a special knee pillow. You can use one of the pillows mentioned above. Or, your old one that you’ve been using for your head before upgrading to the new one from this list. You might be wondering, how hard can it be finding a nice pillow for sleeping on the side? Well, let me just tell you: it’s really hard. Some are not thick enough, others are too soft, and some just don’t feel right. However, the 7 pillows I’ve introduced to you today have everything to be called the best pillow for side sleepers. And the most comfortable one among them, in my opinion, is the Organic Shredded Latex Pillow by Plushbeds. It is supportive and cradling at the same time, and its thickness doesn’t even need to be regulated, as it is perfectly suitable for sleeping on the side. I loved using this pillow and I believe it can help you sleep like a baby too! Which one is your personal favorite? Are you ready to toss away your old pillow and get a new one, designed specifically for your favorite sleeping position? Comment down below! We moved into a new apartment and the bed settings i got from my furniture artist had it that all the beds in the house are low. I can sleep on any side of my body, which pillow type do you suggest for my house? What would you say about ultimate pillow? Martins, I would recommend you a memory foam pillow because it remembers your shape during the night and allows different parts of your body to rest in natural positions. Organic Shredded Latex Pillow has helped me a lot especially in sleeping very comfortably wit my kid. My baby don’t sleep alone on her bed thereby leaving me anxious. This always me sleep with one eye open. Recently i enjoy every bit of my sleep because i lye on my side comfortably. The product is worth it. There’s no zipper on organic shredded latex pillow and I was ignorant of it. Pillows with side zips are easier for adjustment. Anyways, it isn’t bad.